Why you need a new garden fence today! 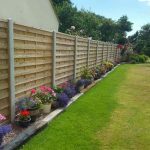 When you’re investing in a new garden fence or a wall for your garden, there can be many things to consider to ensure you get the most from your money and end up with a fence that can really complement your garden and make the most of the space you have. Security – A major reason to consider a new fence, but not necessarily your first thought when you are choosing what type to go with. We can advise on what fences would deter people from climbing over and entering your garden. Just having one fitted means your garden will be less open and protect items in your garden. Privacy – you may get on really well with your neighbours and enjoy chatting to them over a BBQ in the summer months, but we’re sure there are times when you just want it to be your family. 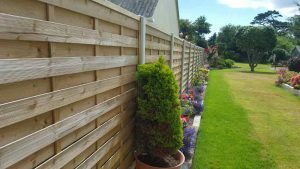 A fence can give you that privacy whilst complementing both gardens and without compromising your relationship with your neighbours. Improving the look of your garden – perhaps the main one we all think about. 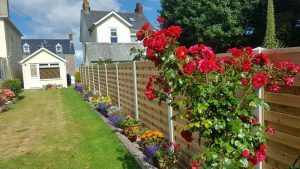 New garden fencing can improve your Jersey home massively and with so many options to choose from, we can guarantee you will be able to find one which will suit the style of your home and garden. A good fence can also help divide up your garden as well as protect some of your plants and vegetables from the elements! A new garden fence can make a huge difference to your garden so contact us today to get a free quote and hear about all the options available to you! 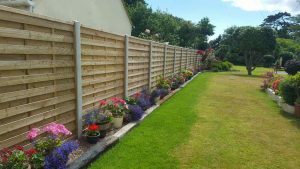 Find out more about the garden fencing we offer at Bernie’s Gardening Services. Read more blogs from Bernie’s Gardening Services. The summer months saw the Bernie’s Gardening Services team transform some of your gardens from mediocre to marvelous! 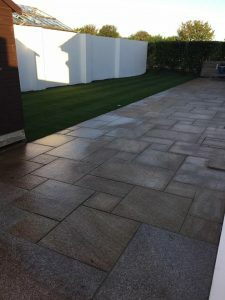 One particular customer was so happy with the work that our team completed that she described the service she received on her Guernsey patio as “exceptional”. We laid a patio and pathway around the side of the house before laying a new lawn for the family. Take a look at the photos and see what you think. The family now have an area they can enjoy the warmer weather and some alfresco dining! 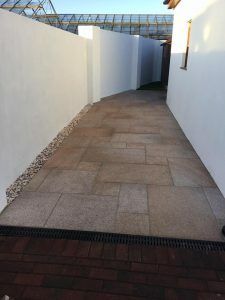 This pathway makes a much more pleasant walk for the family to leave the home from the back garden without walking through the house – ideal if you are taking the kids out on their bikes! Whatever outdoor space you have, Bernie’s Gardening Services can create you the perfect place to relax and enjoy! 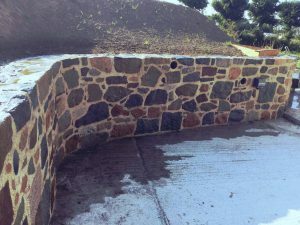 Read our customer’s testimonial about the work we completed for her! 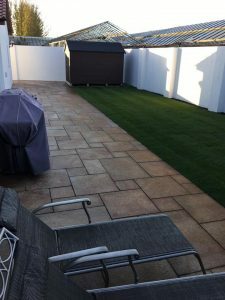 If you would like to improve your outdoor space with a new Guernsey patio, contact Bernie’s Gardening Services today for a free, no obligation quote! We are pleased to say that we have a job vacancy available at Bernie’s Gardening Services which we think is an exciting opportunity for someone to join our team. We are looking for an enthusiastic labourer to join their expanding team! 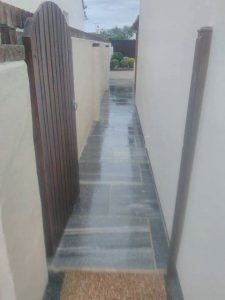 Our company works all over Guernsey, improving the gardens and outdoor spaces of the homes on the island, including laying patios, landscape design, fencing and much more. This is a great opportunity for someone to learn more about what goes into transforming someone’s garden and be part of a hard-working, much loved team. A clean driving licence is required for the role. If you have any questions or wish to apply, please email andre@berniesgardeningservices.gg and join our team! The family now have an area they can enjoy the warmer weather and some alfresco dining. the new athway which runs down the side of the house – making a much more pleasant walk for the family to leave the home from the back garden without walking through the house – ideal if you are taking the kids out on their bikes! Whatever outdoor space you have, Bernie’s Gardening Services can create you the perfect place to relax and enjoy. Read our customer’s testimonial about the work we completed for her. Guernsey Landscaping Design this summer! Our team have been working hard throughout the summer transforming the gardens of Guernsey! Using their Garden design skills, they have created some magnificent gardens throughout the island, really showcasing our Guernsey landscaping design skills! 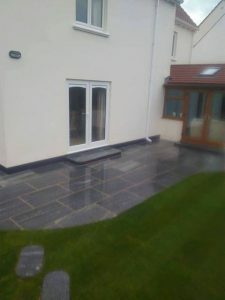 A newly laid patio with washing line incorporated into the lawn – a practical addition to this impressive space. A stunning design with garden fencing fitted around the lawn area to separate it from the driveway. A multi-use patio to really relax on and enjoy. The quality materials we used, and always use, mean it will look this striking for many, many years. This design has incorporated a new lawn, patio and a border to grow flowers and plants – perfect for anyone green-fingered! A pathway designed and built to lead up to a raised patyio area. A pond in progress – this will soon become a focal point of this new garden. A stunning wall built to complement other work we were doing in this garden. Stepping Stones make a quaint path so the homeowners can sit and enjoy their new garden. A new patio matches the stepping stones and complements the new lawn. The patio flows around the house, leading to new shrubbery. 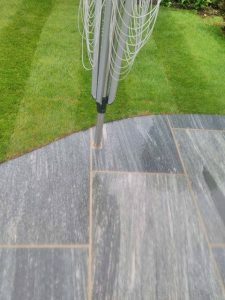 A washing line built into the new patio, making the new area practical for the homeowner. A secure side gate was fitted to seperate the front and back gardens. 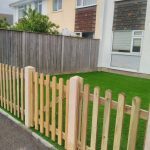 If you are interested in our Guernsey landscaping design services, please get in touch and see what we can do to help! We can design your garden based around your needs and lifestyle. 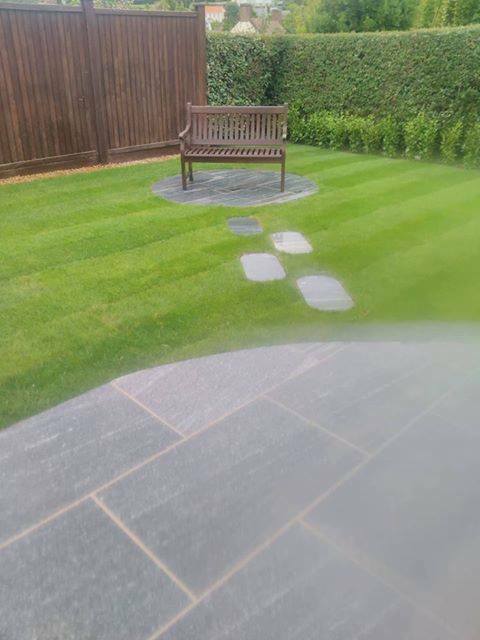 Our team have transformed gardens of all sizes and are passionate about transforming your outdoor space. Take a look at what some of our satisfied customers have to say about the work we have completed for them – Bernie’s Gardening Services testimonials. Every sat there and dreamed of how your ideal garden would look? Do you wish your patchy lawn was luscious and green? Could you picture yourself enjoying the summer sun while dinising alfresco ona perfectly laid patio? If so, give Bernie’s Gardening Services a call and let us help you with your Guernsey garden design. 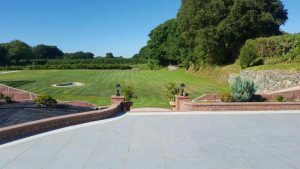 Recently, our team transformed a large garden in Guernsey into an outdoor space anyone would be thrilled to look out onto. To start, we had to move several tens of tons of soil – not the easiest in the recent warm weather! We then built two walls with slippers before creating a top garden patio to really make the most of the amazing view on offer. 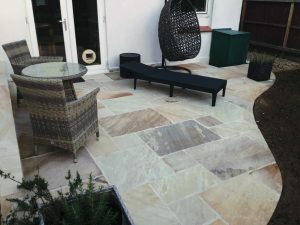 Two sets of steps were then beautifully laid around the slippers setup and we designed one long bottom patio, a BBQ area using mapex and gravel before adding a gravelled flower area at the top, with a round hole for a jacuzzi with slippers around It. 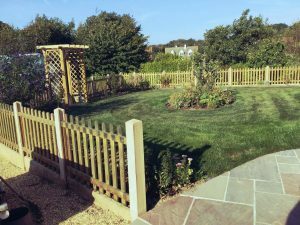 The whole Guernsey garden design and working to make the design a reality was hard work, but when you see the finished garden, we’re sure you’ll agree that the hard work really has paid off! Take a look at the video below and see what you think. If you like what you see and would like to find out more about our Guernsey garden design and how we can transform your outdoor space, get in touch and let us come and give you a free quote! Patios, garden design and much more! 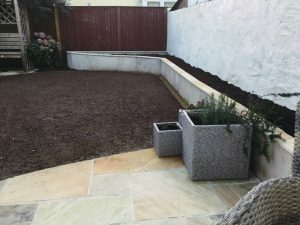 The team at Bernie’s Gardening Services are experts at creating stunning patios and designing whole new gardens for the people of Guernsey as well as being there for those who are tired of having to cut their grass and are fed up of looking out into an overgrown garden with no way of knowing where to start! We believe that a garden should be somewhere for you to relax in and enjoy now the days are filled with sunshine and the evenings are the perfect temperature to sit and enjoy your favourite tipple outside rather than indoors in front of the TV. Some gardens may be so overgrown that dealing with the task can be overwhelming and something you put to the back of your mind, behind everything else you have going on. However, you know you will regret this when the sun is shining and you want to get the BBQ warmed up and invite friends and family around for some alfresco dining. 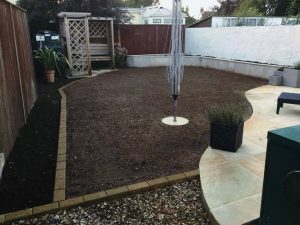 Here at Bernie’s Gardening Services, we offer a free garden design service as well as offering an honest and professional opinion on your outdoor area, making suggestions on fencing, patios and artificial vs natural grass and other ways to make your garden simpler, tidier and much easier to manage! Contact us today for a FREE quotation and get started on transforming your garden! See what some of our happy customers have to say about work we have done for them on our testimonials page. Take a look at the video below and see just a fraction of what we can do to create you your perfect outdoor space! 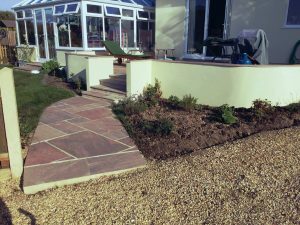 The team at Bernie’s Gardening Services are able to transform your garden, whatever state it may be in with our Guernsey garden design. We wanted to share with you a job we completed for a very happy customer who’d had an extension built on their home. As wonderful as the extension looked, the workmen, equipment and supplies had destroyed their outdoor space, as works like this generally do. The family contacted Bernie’s Gardening Services and we used our garden design skills to make sure they had an impressive garden to complement their newly extended home. Our team designed a new patio with steps leading up to the house, giving the family somewhere to put their outdoor furniture for when they chose to dine alfresco. We laid a whole new lawn, designed and built walls to give them somewhere to put their plants to add colour to the outdoor area. 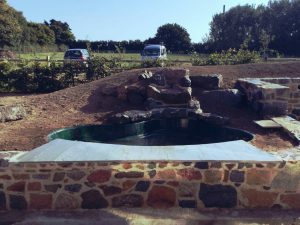 From what was essentially a building site, the family made use of our Guernsey garden design and the skills of our team and now have somewhere stunning to look out onto and use. Take a look at the video below to see the work we completed. If you are interested in Guernsey garden design and want a revamp of your outdoor space, contact the team today and let us design and transform your garden! Guernsey patios gets five stars! 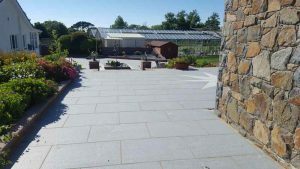 The team at Bernie’s Gardening Services are thrilled to have their very own page on the Best of Guernsey website due to the exceptional Guernsey patios we have created and the gardens we have transformed ! 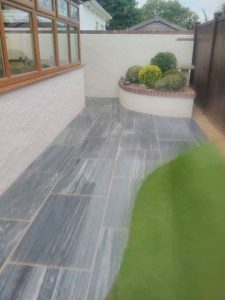 The page showcases the landscape gardening services that we offer to the people of the island, as well as the Guernsey patios that we provide, our stonemasonry work as well as our timber services. The Best of Guernsey website showcases the best and most reliable businesses that Guernsey has to offer. It enables the people of the island to get recommendations for wide range of services, such as our patios or garden landscaping. Many of our clients return to us for further works they would like doing, which shows the commitment and dedication we have to ensuring our customers are 100% satisfied with the work we complete, long after we have packed up our equipment and gone home! If you would like to find out more about what we offer and how we can transform your outside space, contact our team today and get a five star garden! Find out more about all the garden landscaping we can provide! Despite the cold weather, the sun is shining in Guernsey and the Bernie’s Gardening Services team are working hard getting the gardens of the island ready and blooming for the spring and summer months! One of the ways we are doing this is through garden fencing! We use high quality fence panels to ensure they can withstand strong winds and keep your garden looking good. Each panel is treated to ensure its longevity and to protect it against the elements, meaning our valued customers get the most out of their fencing from us. 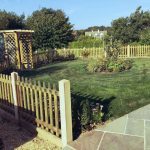 Find out more about our garden fencing and timber services. Contact us today and see how we can help transform your garden in time for summer, with our fences, landscaping and garden maintenance services! We can talk you through your options and help create the ideal outside space for you and your family to enjoy. Please let me know if you have any queries or need any help with these widgets.